Tags: 2018 WSOP, Craig Varnell. Posted on Tuesday, June 12, 2018 by "T". Craig Varnell managed to defeat a massive player field of 2,419 entries to win his first ever bracelet in Event #19: $565 Pot-Limit Omaha event for $181,790. This was his third final-table finish at the WSOP series. Varnell entered the final table in second chip lead behind Maxime Heroux, with 2010 WSOP main event winner Jonathan Duhamel very close to his chip stack number. Varnell managed to defeat Duhamel who settled in 6th place, securing the chip lead in the process. He accumulated a dominant lead after knocking off Heroux in 4th place, entering three-handed play with 75% of the chips in his possession. Varnell knocked off Omar Mehmood in 3rd place and he has 6-to-1 advantage into the heads-up match against Seth Zimmerman. In the final hand, it was Varnell's K-J-9-5 against Zimmerman's A-K-Q-4, with the board revealing Q-J-3-6-9, giving Varnell two pair for the win. Varnell said after he won, "It felt good to finally close one out. I almost didn't play this event. But when I did, and I got a stack, I had a big advantage over the other players." He almost did not participate in the event after his terrible run in the Colossus event. The poker player from Colorado assumed he fired eight bullets in that event but everything was a miss. 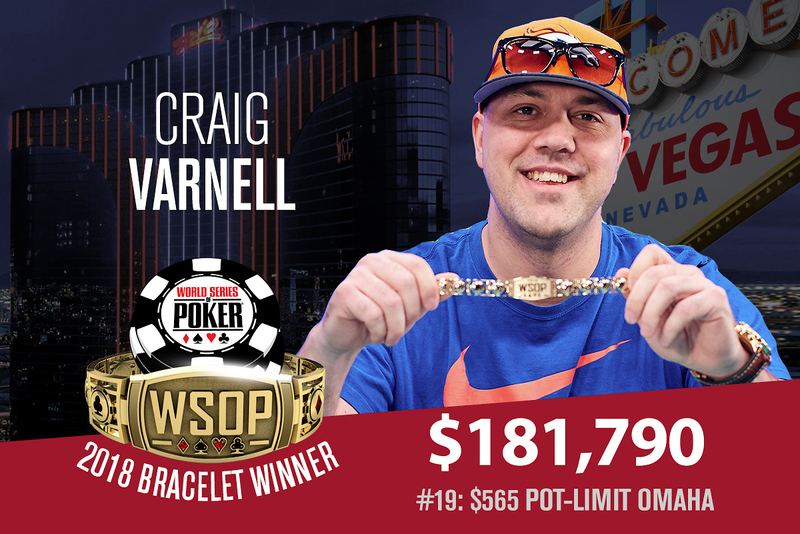 Craig Varnell is a former car wash attendant, but those difficult days are way behind him now as he relishes his first WSOP bracelet and the $181K prize money. He said as he claimed his bracelet, "You never think when you play poker for a living you're going to get this moment. To win a tournament is so hard to do. This is the monumental moment, you made it." 7 comments for "2018 WSOP: Event #19: $565 Pot-Limit Omaha won by Craig Varnell for $181,790"
ok a 565 buyin in the wsop sounds kinda low, and since this is a popular game, pot limit Omaha a little bit surprised to see only 2400 or so players, sure this is a big number, but with such a buyin I wouldn't be surprised seeing 10k or more entrants. Because of this Pot Limit there were only 2400 players in this Omaha Tournament. This limitation makes these players not to join in these tournaments. All in is very good for all gamblers and this is unacceptable for many players. Patience is not for everyone. I congratulate all the final table players. Big congratulations to Craig Varnell for winning the US$565 buy-in Pot-Limit Omaha tournament and winning $181,790. It takes an enormous amount of dedication and perseverance to maneuver through a field of 2,419 players from all over the globe. well this is good profit on this kind of poker game,to win over 181 K of dollars,for nice buy in!lot of players to beat,so you have to be good and to play smart!he can say that he have bracelet and that he is one of WSOP winners!